And no Sondheim show initially proved more difficult for audiences to love than this musical morality tale, which tells a showbiz story about the fraying of friendships, the temptations of selling out, and the hidden price of success. “Merrily’’ itself, however, was just beginning to gather steam. Belated appreciation for the musical steadily grew in the years following the Broadway debacle, especially for Sondheim’s gem of a score, highlighted by tunes like “Not a Day Goes By,’’ “Old Friends,’’ “Our Time,’’ “Good Thing Going,’’ “Now You Know,’’ and “Opening Doors.’’ The failure of “Merrily” became part of its legend. Somebody, the thinking went, would eventually get it right. Which brings us, happily, to Maria Friedman’s outstanding production of “Merrily We Roll Along’’ at Huntington Theatre Company. “Merrily’s’’ flaws remain — this will never be a perfect show — but Friedman’s production captures the (broken) heart and (damaged) soul of this elusive, melancholy, funny, and challenging musical about as well as anyone is likely to do. Based on a staging by Friedman in London several years ago that was widely acclaimed, including by Sondheim himself, the Huntington’s “Merrily’’ is toplined by two of the three stars from that West End production and fortified by a crackerjack ensemble that includes a sizable number of well-known Boston actors. Two of Boston’s brightest musical talents, Aimee Doherty and Jennifer Ellis, more than validate the decision to cast them in key roles. Soutra Gilmour created the spot-on costumes (prepare for fashion flashbacks) and the handsome set. Matthew Stern leads an excellent orchestra in consistently vibrant playing. Alas, the script by George Furth is still as glib and superficial as ever, rife with lines like “Know what I’m having? Not much fun’’ and “The worst vice in the world is advice. So I don’t give any.’’ The transit from Furth’s dialogue to Sondheim’s songs is like being transported from the shallow end of the pool to the deep end in an instant. Fortunately, it’s seldom too long between songs. Seldom have Sondheim’s matchless skills as a musical dramatist been more important in terms of character depth and thematic heft. Because the story of “Merrily’’ unspools in reverse chronology from the mid-1970s to the late 1950s, following its trio of protagonists from middle age back to their idealistic youth, the show’s emotional and psychological trajectory is unusual: It begins in disenchantment and ends in hope. That poses significant challenges to the three actors at the center of “Merrily,’’ and they meet them admirably. 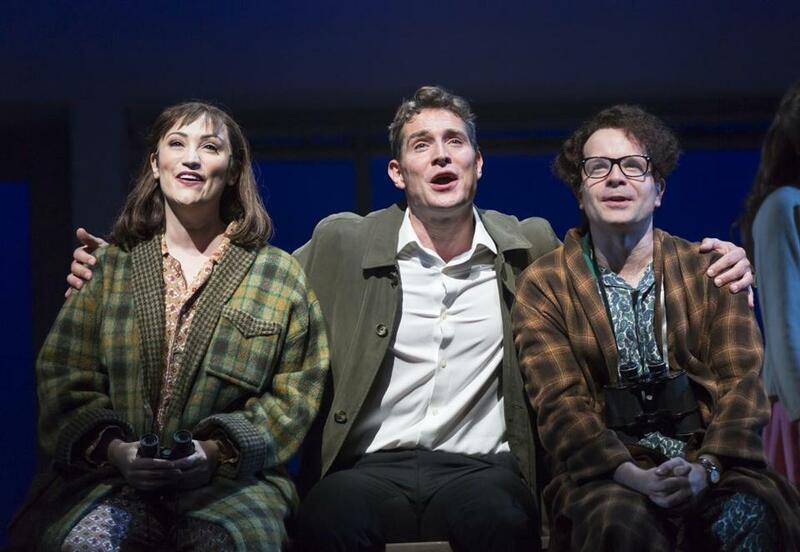 Mark Umbers is simply extraordinary as Franklin Shepard, known as Frank, a gifted Broadway composer turned commercially successful producer of blockbuster movies. It is Frank who generates most of the conflict and embodies most of the contradictions that drive “Merrily.’’ Umbers creates a Frank who exudes magnetism and vulnerability in equal measure, no small trick. Damian Humbley excels as Charley Kringas, the lyricist embittered by his songwriting partner’s decision to go Hollywood. And Eden Espinosa, the newcomer to the cast, is both a galvanizing and poignant force as Mary Flynn, the hard-drinking theater critic (!) who carries a torch for Frank. Portraying Beth, Frank’s first wife, Ellis delivers a rendition of “Not a Day Goes By’’ that is both shattered and shattering. Doherty, meanwhile, seems to be having the time of her life as Gussie Carnegie, the vain and self-absorbed actress who becomes Frank’s second wife. Boston actor Christopher Chew is largely enjoyable as a Broadway producer and Gussie’s cuckolded husband, but he overdoes the dese-dem-dose accent a bit. The primary focus is on Frank, Charley, and Mary, and, crucially, Umbers, Humbley, and Espinosa make us believe in their friendship — and in the wrenching pain each of them feels when that friendship starts to rupture. Meanwhile, director Friedman’s unerring focus on the big picture beyond the shiny surface of “Merrily We Roll Along’’ brings urgency to the universal questions this musical, with its exceptionally complicated history, asks about ambition, loyalty, and what gets left behind on our journeys through life and career. Music and lyrics by Stephen Sondheim. Book by George Furth. Directed by Maria Friedman.